To tell the truth, I was not emotionally prepared for this film. The Fault in Our Stars is based on the bestselling novel of the same name by John Green. When I read The Fault in Our Stars, I was a bit late to the party. Already a huge success, I was intrigued to see why this novel had such a massive fan base. It took me a day to read it and believe me, I was absolutely broken after. I really had never been so affected by a book and the last time I cried at a book was probably the seventh Harry Potter book. So when I heard that there was going to be a film adaptation, I could not wait, although I knew it too would be an emotional roller coaster. 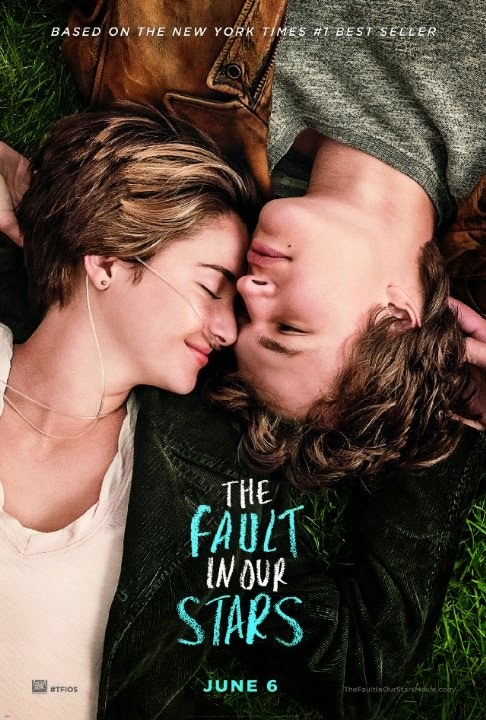 The Fault in Our Stars is the story of Hazel-Grace Lancaster, a sixteen year old cancer patient, who is forced to attend a Cancer Support group, where she meets the eighteen year old Augustus Walters, a former cancer patient and amputee, from this meeting a love story blossoms. Cast in the lead roles are Shailene Woodley and Ansel Elgort, both who take the characters of Hazel and Augustus and portray them wonderfully for the screen adaptation. What is so beautiful about this film is the subtly, the honest portrayals from the book and I think how tragically humour is injected in the most darkest moments of the film.The film, like the novel, makes you think about life, love and how you respond to the things around you. How you shouldn't be despairing at life but how as quoted from Hazel's favourite book An Imperial Affliction, "Pain demands to be felt." This film is all about pain, dealing with pain and how those around you also cope with a painful situation. To say I was a bit of an emotional mess is an understatement. I would say the film hit me so much harder than the book, certain scenes were depicted with such beauty and tragedy that I could not help but cry. Then sometimes I would laugh and cry because there would be that element of humour in a particular scene. What could have been a very overplayed cheesy teen film has been turned into a very faithful adaptation, which you could argue is even more thought provoking than the book. Believe me, I was most definitely not alone in the floods of tears. After the film had finished in which you could really hear the sniffling and sobs throughout the cinema, however, the most surreal moment was walking into the Ladies Toilets after the film and seeing a room full of crying women. We all sort of laughed at the weird situation but it was poignant to see how many people the film had affected. The Fault in Our Stars proved to be such a success in my eyes. With a beautiful soundtrack playing throughout the film alongside some really lovely cinematography, the film is not cheesy or what I would deem a totally young adult film. This is a film for anyone who needs that injection of positivity in their life, it is for people who have suffered in their lives and can be told that life will carry on. Even people who have not personally suffered, it will make you think about all the people in your life. I can say fully that this film did not disappoint my expectations and I loved every second of it from start to finish and cannot wait to watch it again. I do warn you, take tissues with you... you're gonna need them! The Fault in Our Stars is now out in cinemas across the country.